The Siege of Antioch project is a collaborative effort between UK scholars and Fordham’s Center for Medieval Studies to produce a full digital edition and translation of an epic crusade romance that relates the story of the siege of Antioch during the first crusades. The UK team is providing a transcribed and translated text, while students at Fordham are encoding the text into TEI compliant XML and developing a platform to publish the finished work. 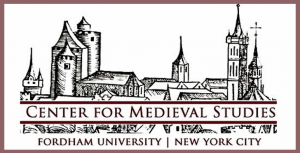 The Fordham team is supervised by Dr. Nicholas Paul, Director of the Center for Medieval Studies and led by graduate students, Patrick DeBrosse and Amanda Racine. The UK team includes Dr. Linda Patterson (University of Warwick), Dr. Carol Sweetenham (Independent Scholar), and Dr. Simon Parsons (Royal Holloway).